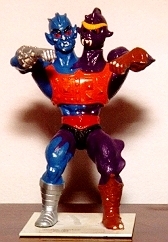 Two Bad is one of two two-headed figures released in 1985 (along with Multi-Bot and Modulok). 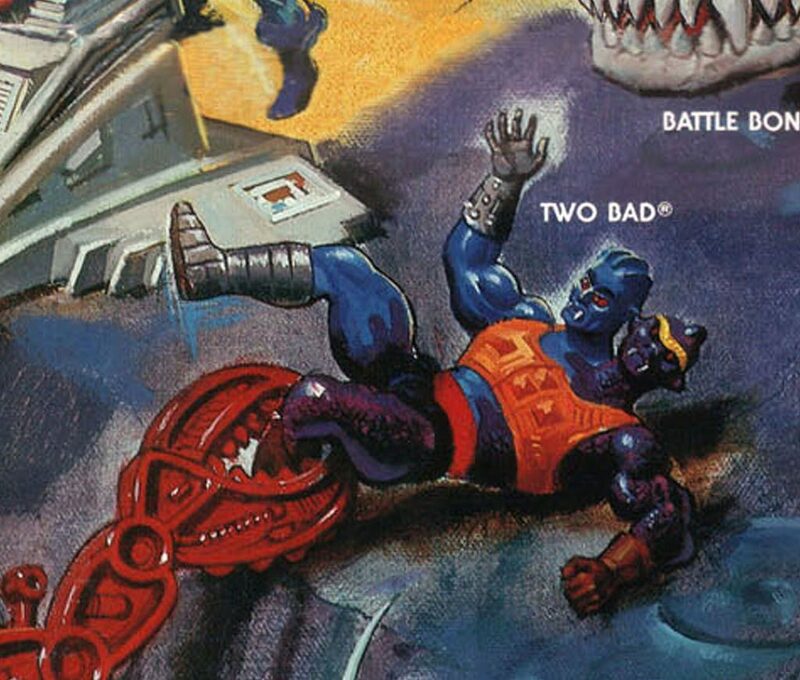 My first exposure to Two Bad came on the playground in third grade. I had gone to the same elementary school during kindergarten and first grade. 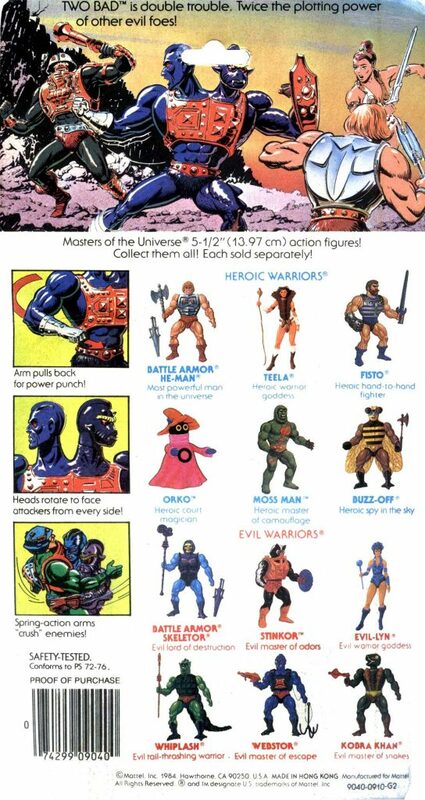 But in second grade, we moved away for a year to a smaller town, which turned out to be something of a He-Man vacuum. All of the kids there seemed to be into either Voltron or Thundercats. 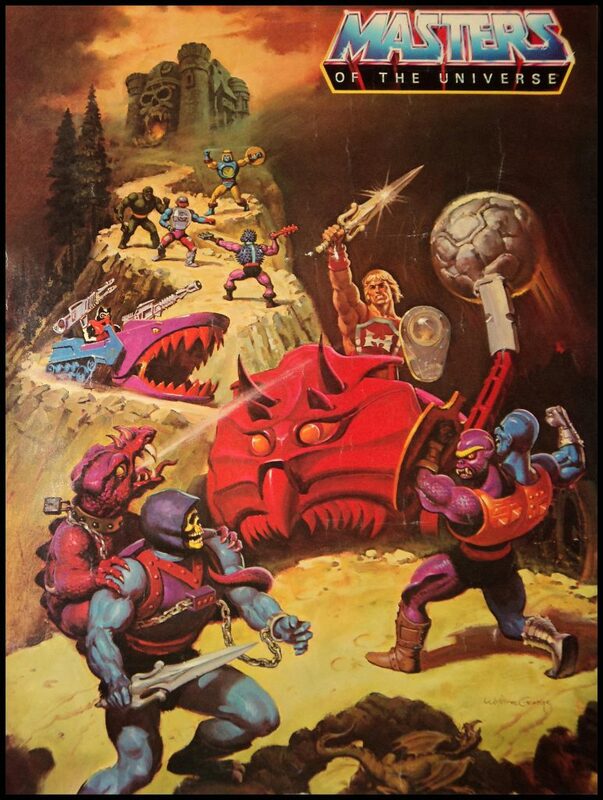 But when I returned to my old school in the third grade, I found He-Man was still going strong there. 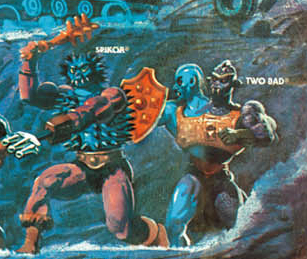 One fall day on the playground, an enterprising kid brought out his Roboto and Two Bad figures. 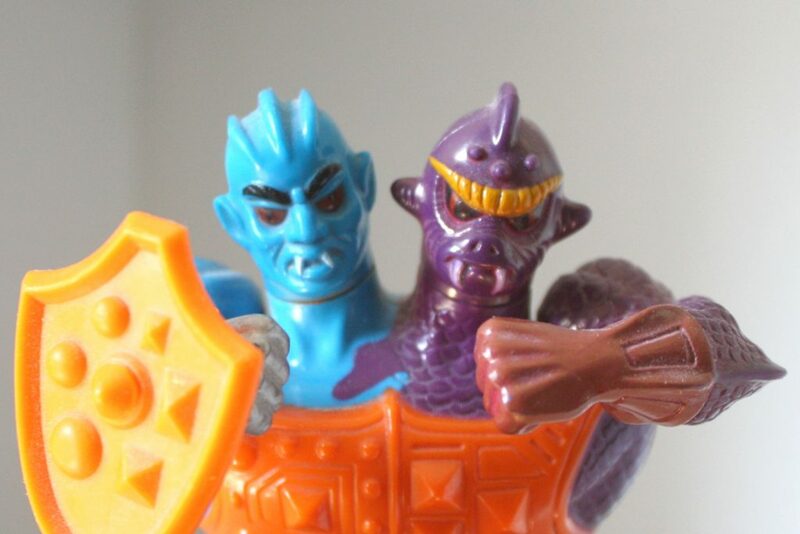 I never had either of these figures myself, but I was pretty impressed with both of them. 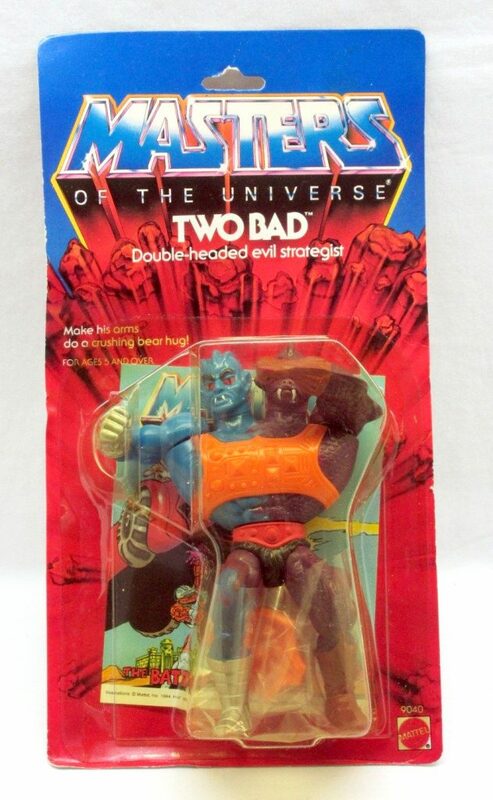 Two Bad was bizarre looking, and not just because he had two heads. 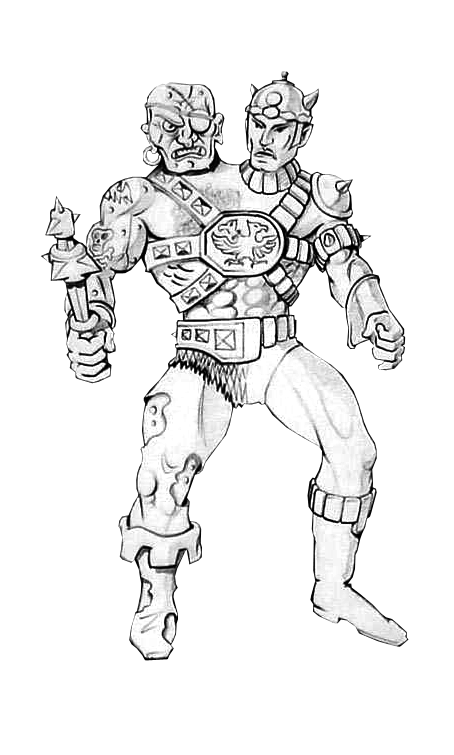 He had an enormous barrel chest and his arms were mounted toward the top of his shoulders rather than to the sides. His main feature of interest seemed to be his ability to punch himself in the opposing heads. 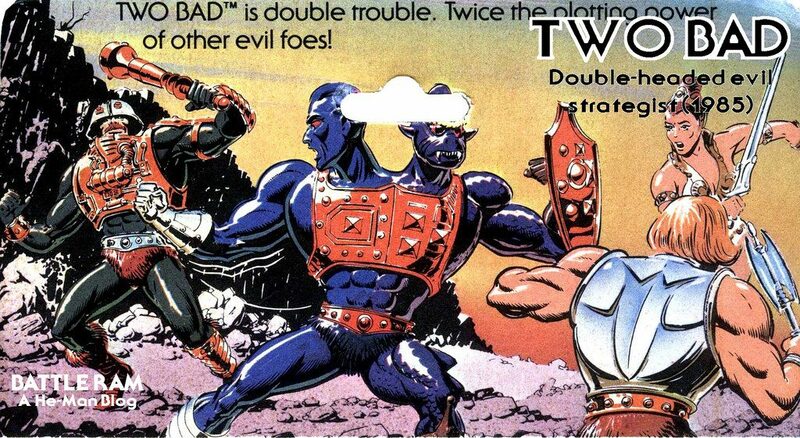 I don’t know who designed the final look for Two Bad, but Roger Sweet seems to have come up with the general concept for a two-headed warrior. 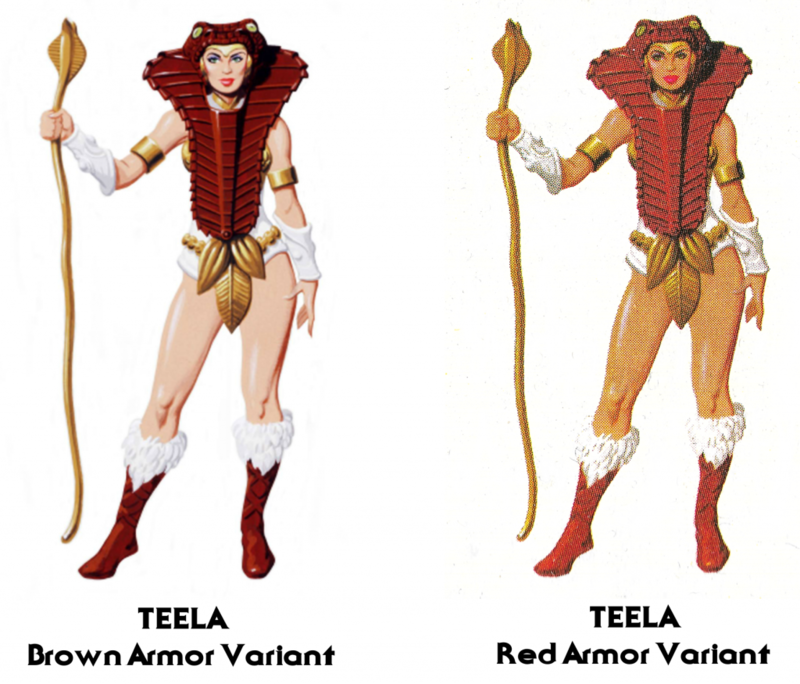 You can see several incarnations of the concept in the images below. 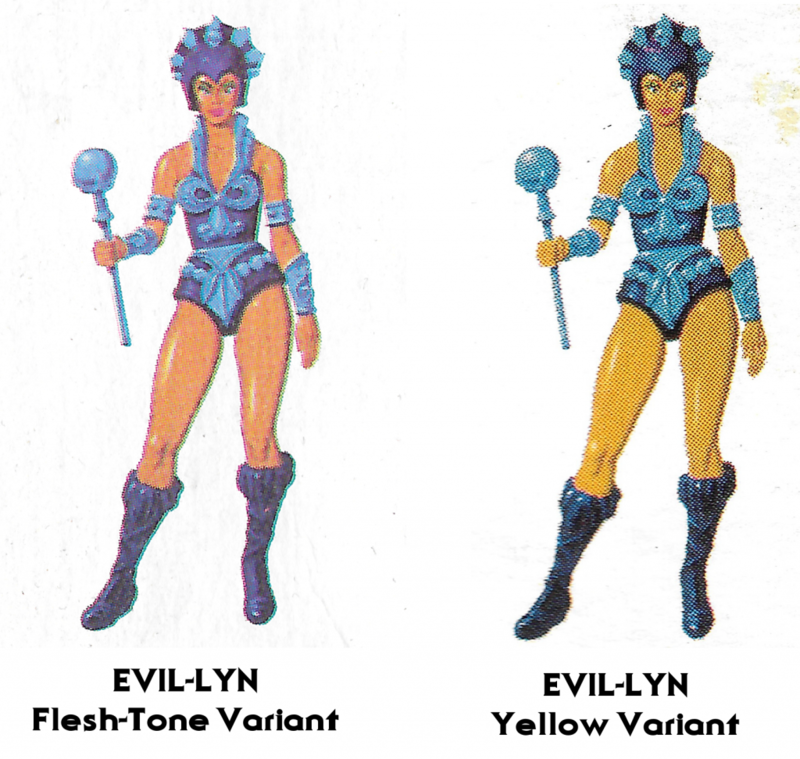 An early idea was for a character that had an evil half and a good half. 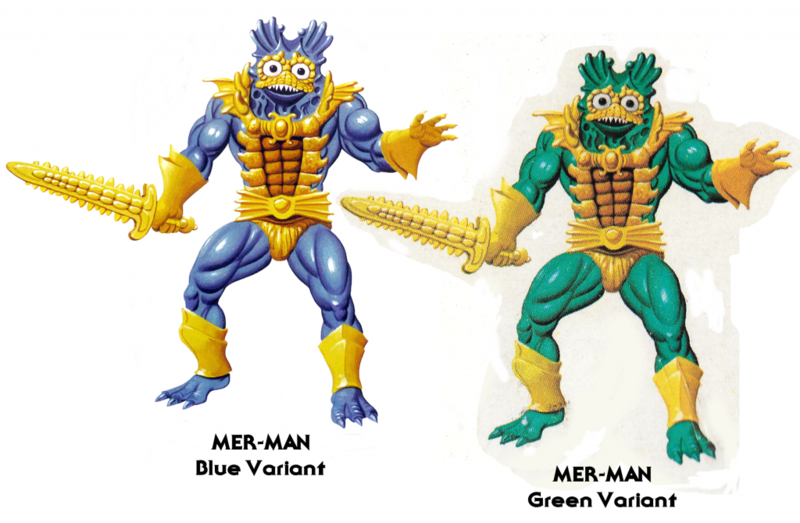 While the final figure was completely evil, he did have a different color scheme and sculpt for each half of his body. 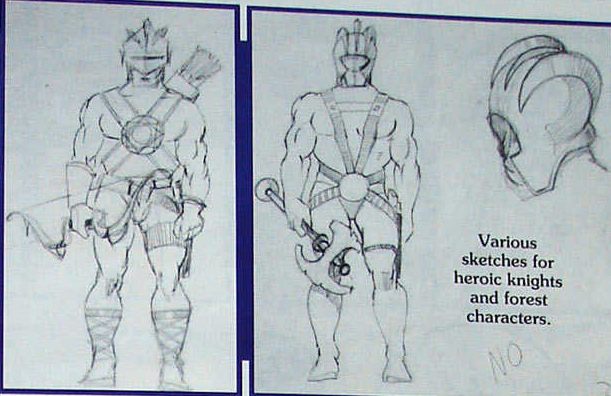 While the concept was Roger’s, I suspect at least some of the artwork was done by Ted Mayer, based on the style. 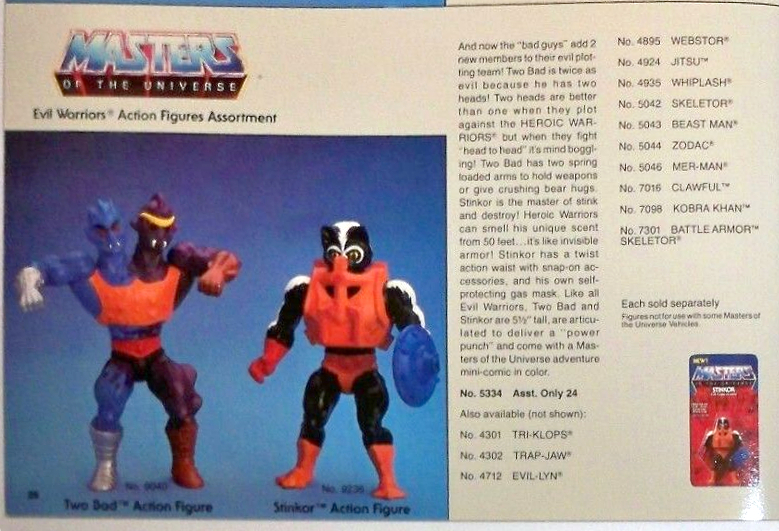 According to the Power and Honor Foundation Catalog, the half good/half evil concept was rejected by Mattel marketing, who said that both halves should be evil. 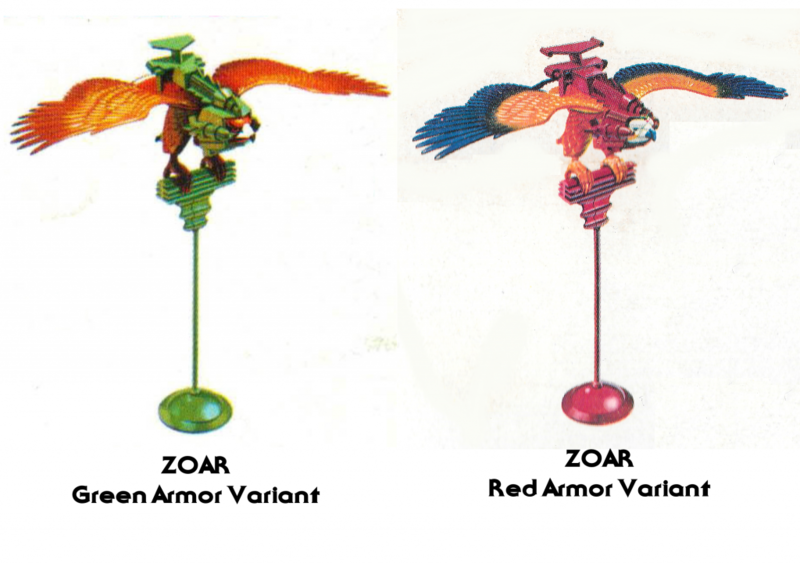 A late hard copy/prototype of the figure shows a few subtle differences from the final toy. The prototype had more prominent and finely detailed ears and horns on the head. 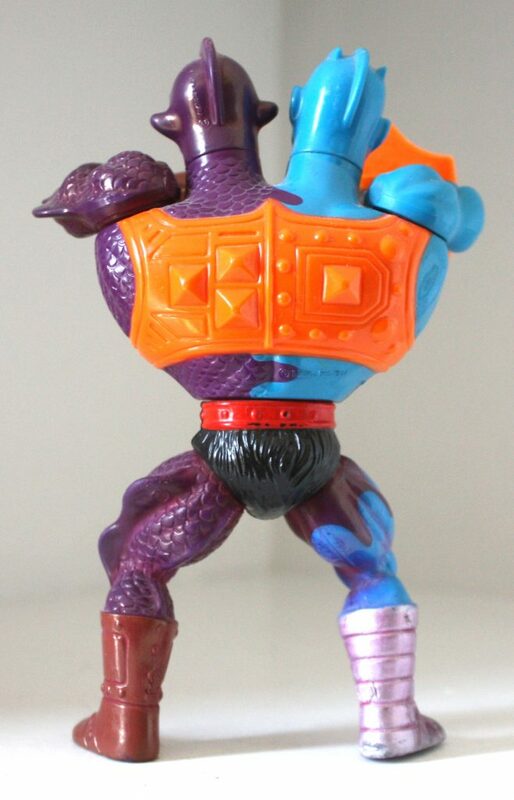 It also had a much slimmer torso design. 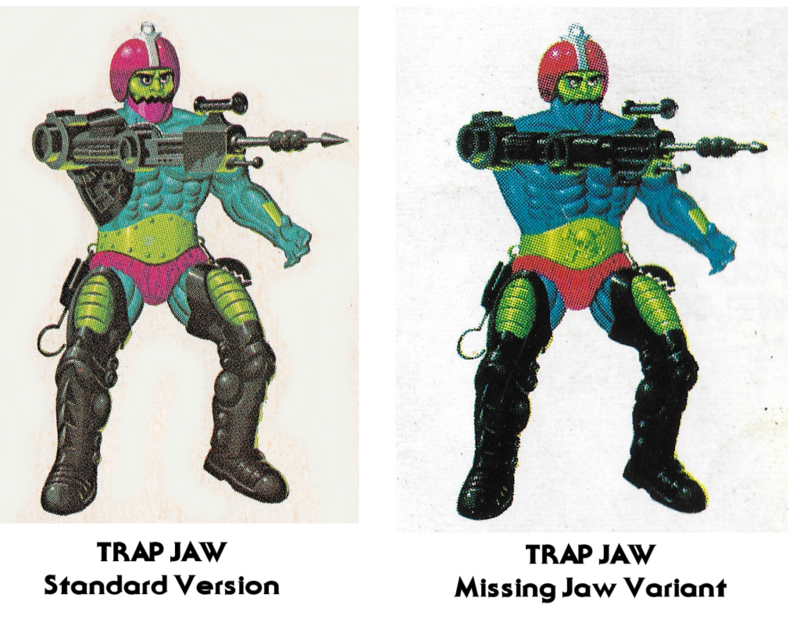 I’m sure that the torso on the final figure had to be enlarged to accommodate the spring punch action feature on both arms, in addition to the spring-loaded waist. 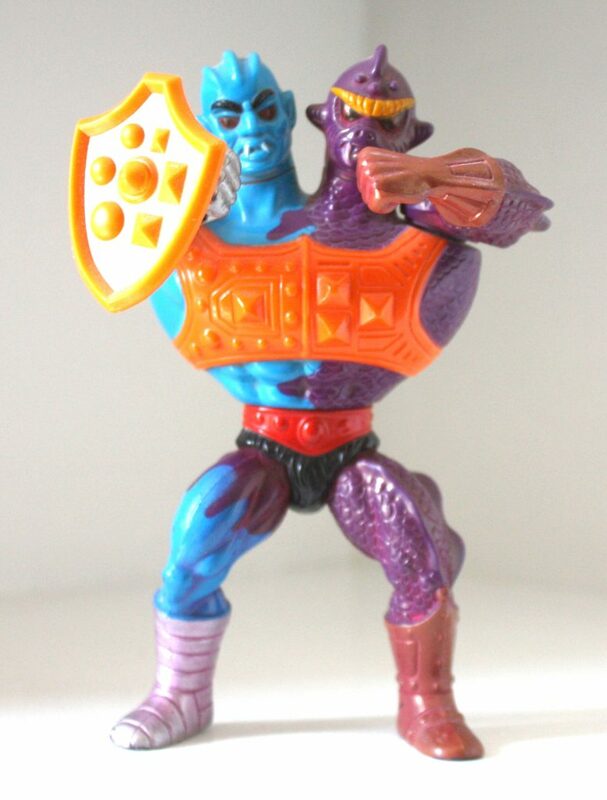 Shortly after it was released, the figure was reissued with a greatly flattened torso. This didn’t affect the width, but it did affect the depth. 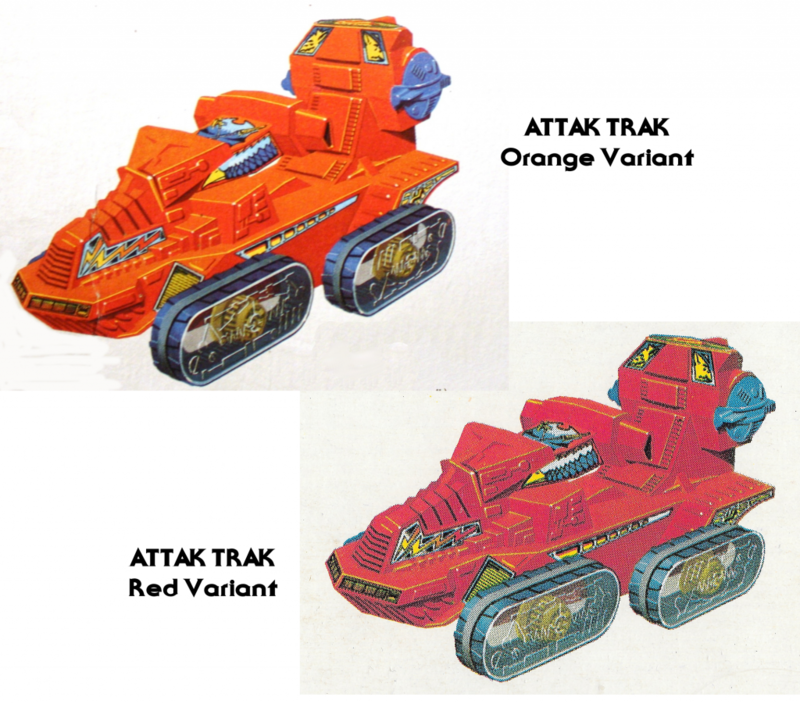 This flattened version seems to be somewhat more common than the original release. 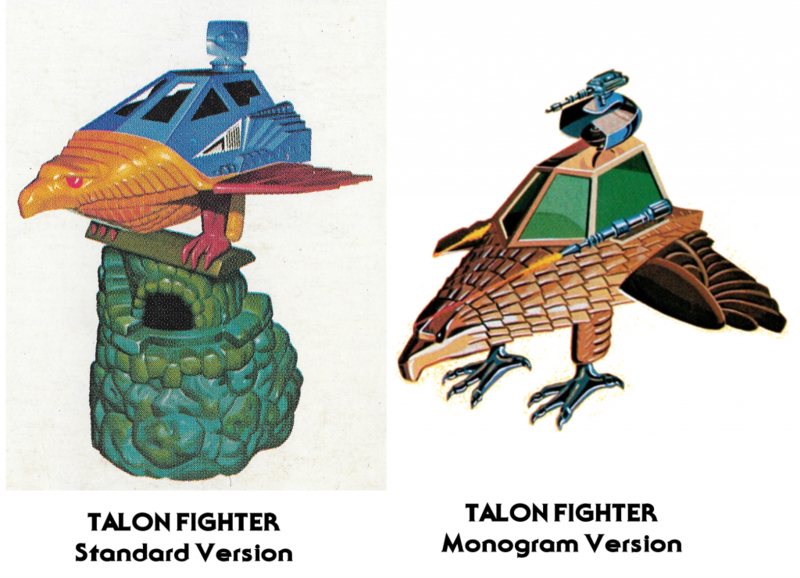 The second version also has its arms at a slightly lower angle, so they don’t obscure the faces as much. Unfortunately Two Bad tends to suffer from discoloration with age. This seems to be “sweating” out of the plastic. It can be cleaned up with a magic eraser sponge, but it eventually returns. 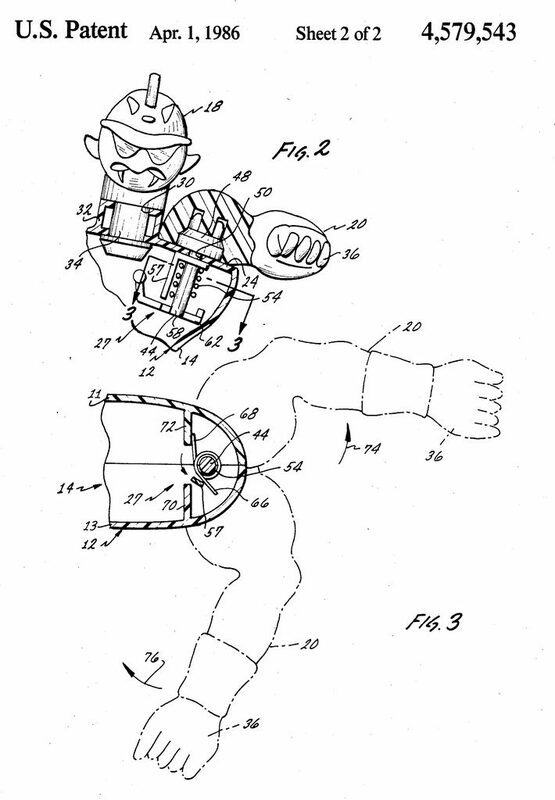 Note that this set of instructions says to “fit arm to body.” The plan early on may have been to package him with his arms disconnected. 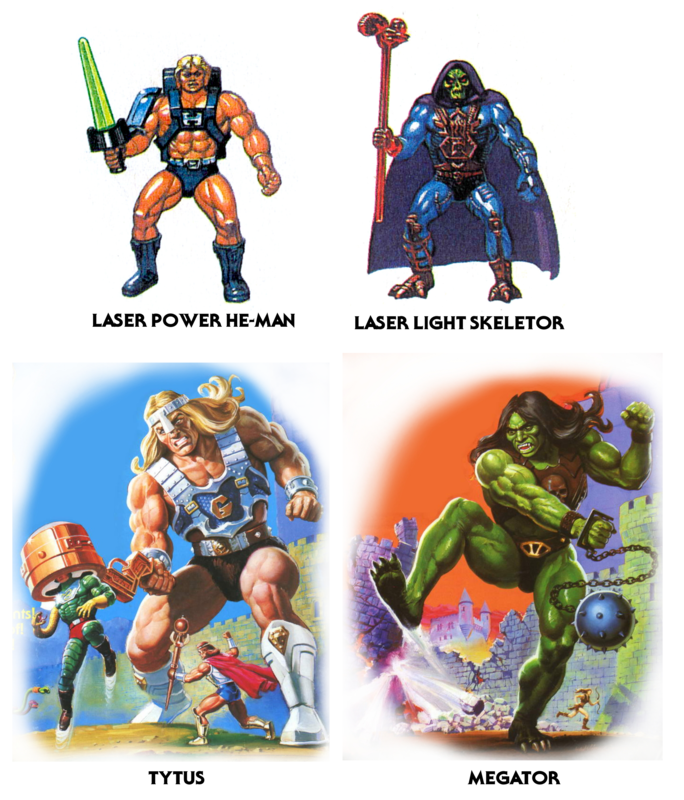 Image source: He-Man.org. 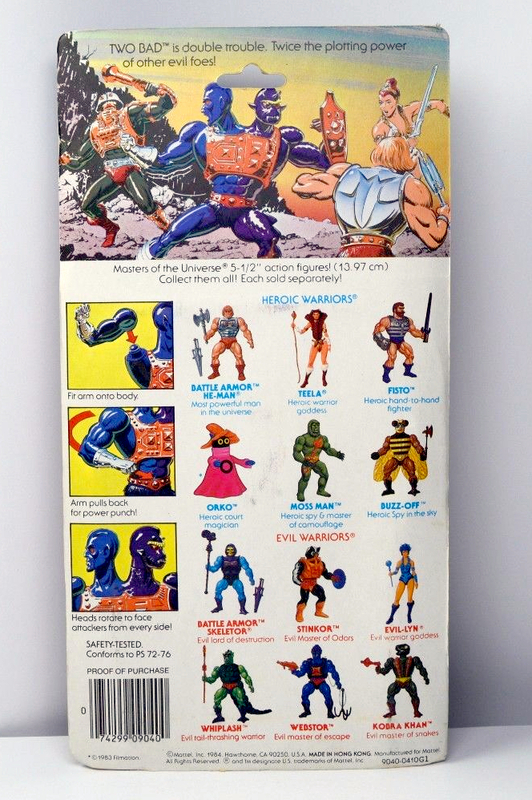 The instructions on this cardback include the idea that the figure can “crush” enemies. 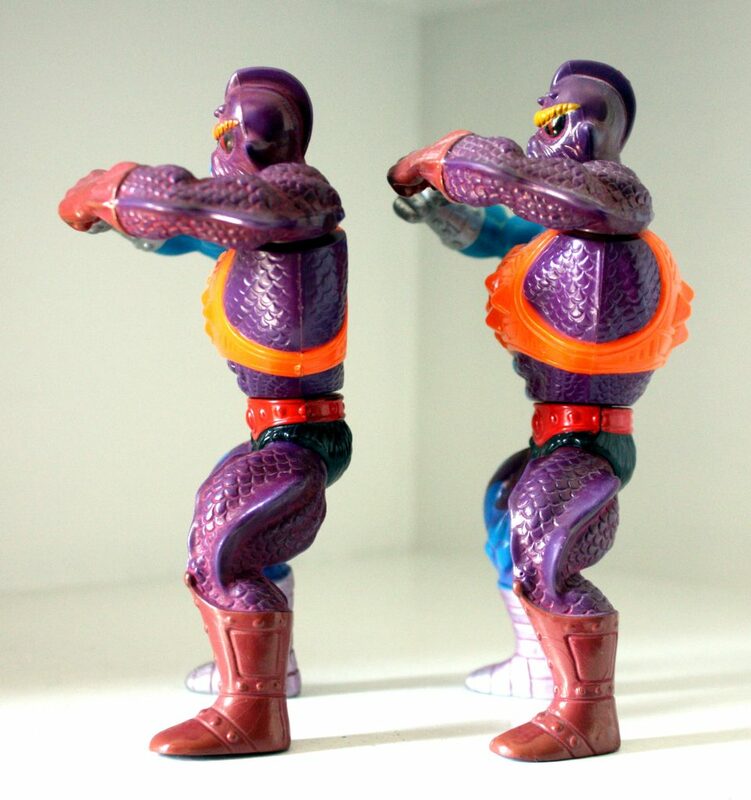 This is easier to do on the second release of the figure, because he chest doesn’t protrude out as much. 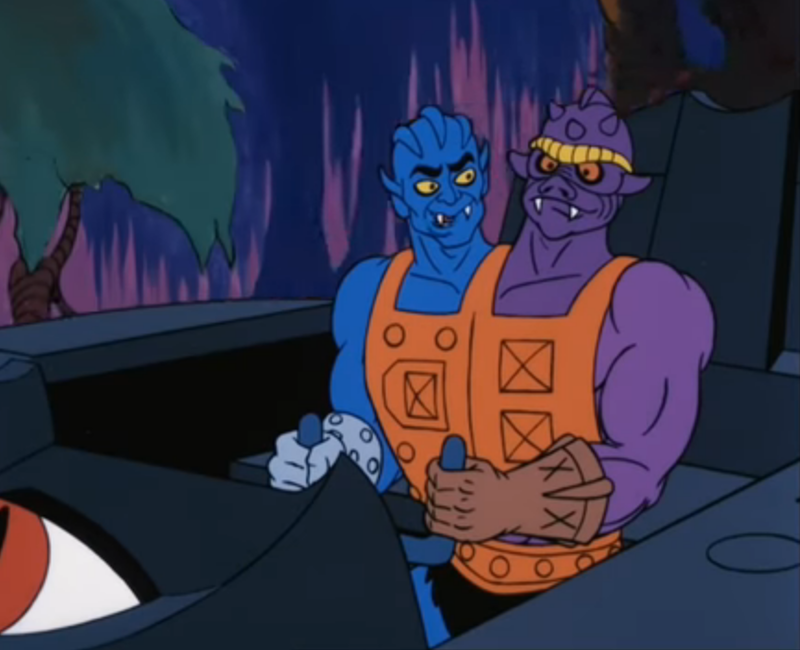 Two Bad is said to be a strategist with “twice the plotting power” due to his two heads, although that characterization was rarely followed in printed or animated stories. 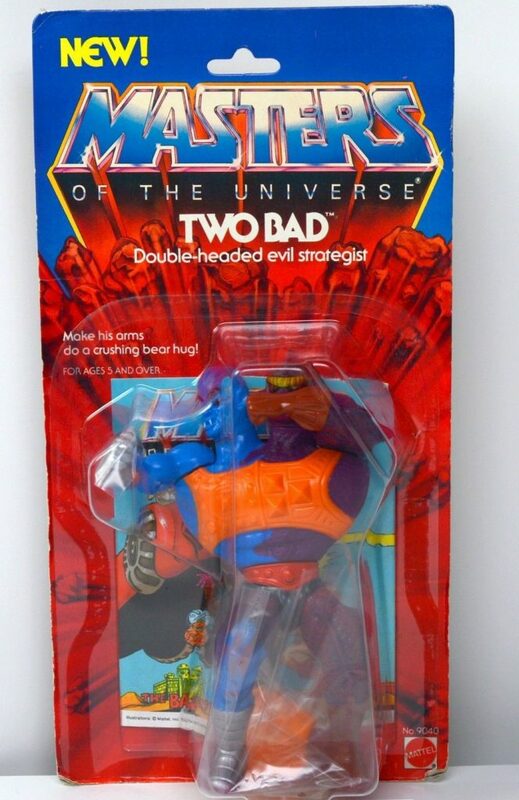 Role: Powerful, two-headed master of evil illusion. 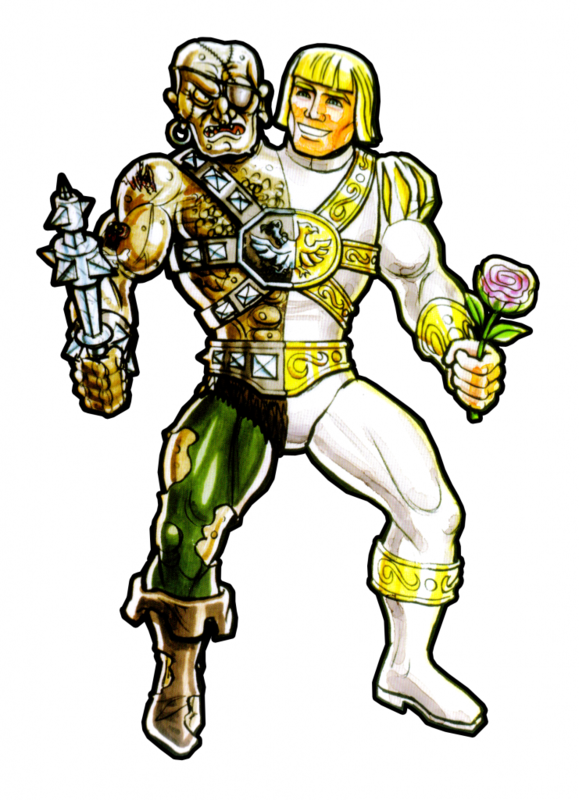 Power: Ability to create the illusion that he is “two” evil warriors, twice as devious as any of his comrades. 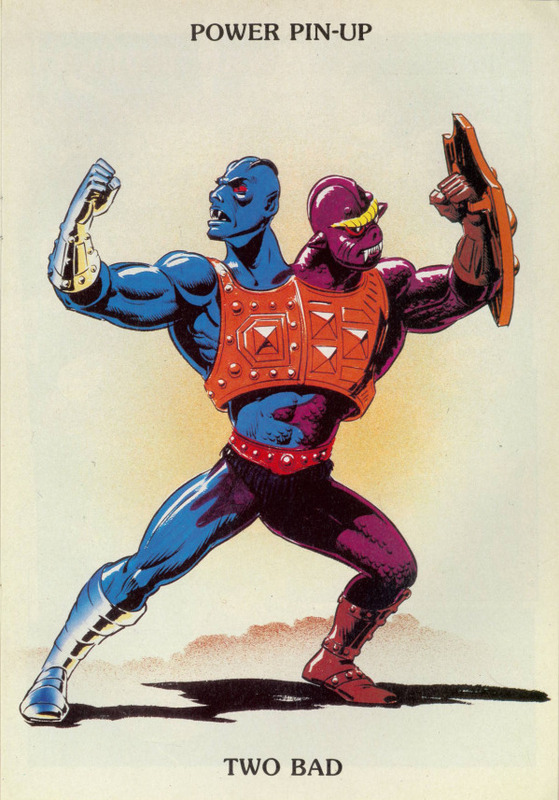 Character Profile: Though two heads are often better than once, Two Bad is a mixed blessing for the Evil Warriors. 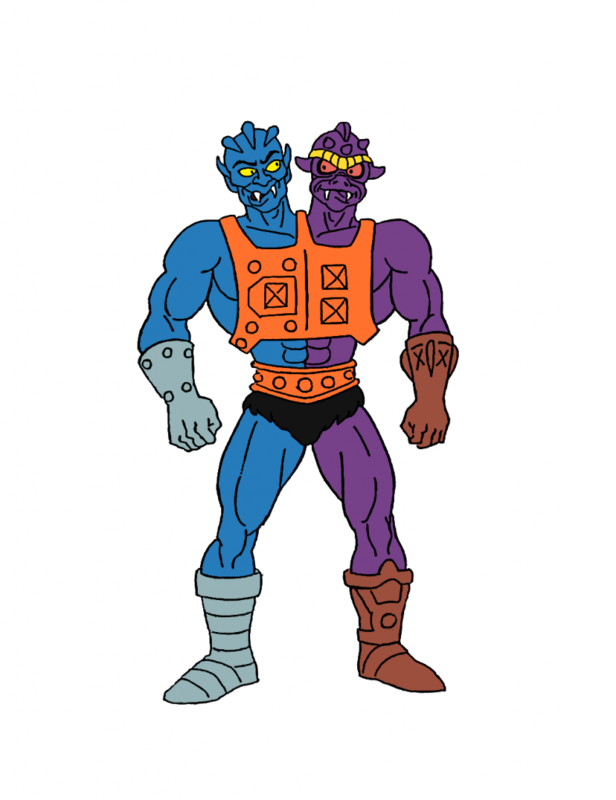 When his two heads are working together, Two Bad is nearly as clever and devious as Skeletor, and his advantage in battle is doubled. 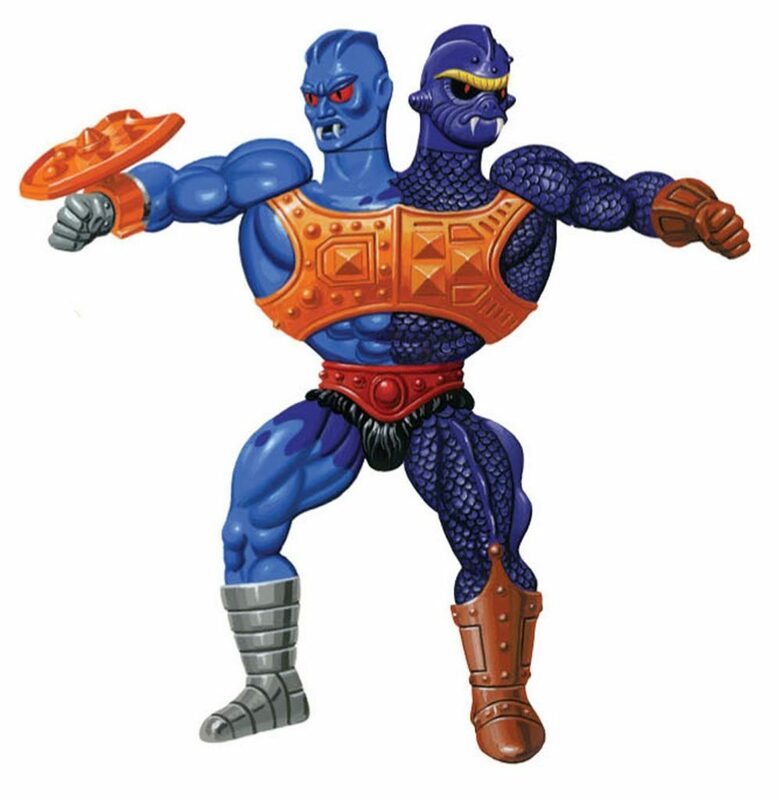 However, his two heads rarely get along. Quite often, the two heads will bicker with one another just at the wrong moment. 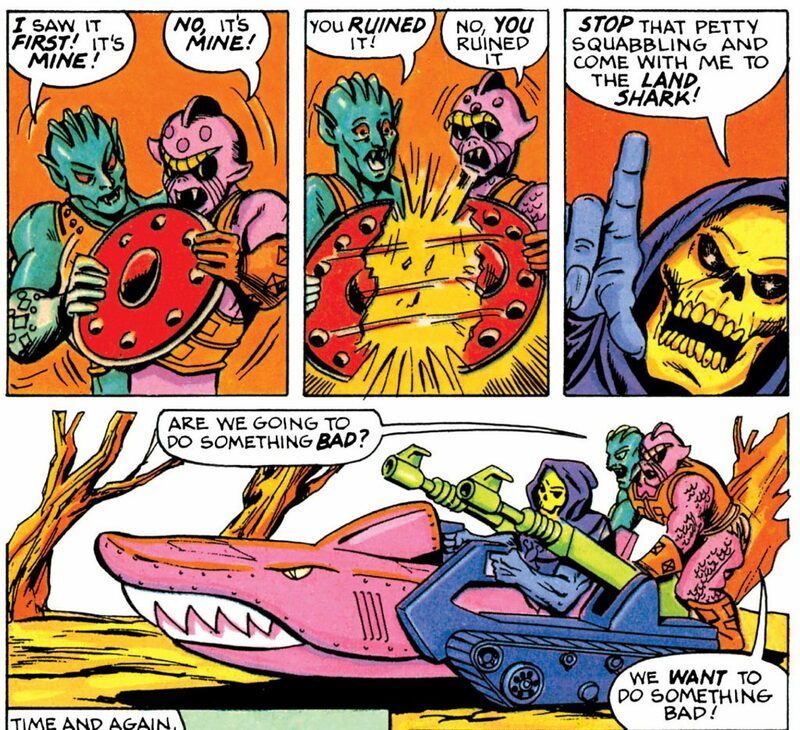 Skeletor has little patience with Two Bad, not only because of the distracting arguments, but because Skeletor feels that the two-headed beast could one day gain too much evil brain power. 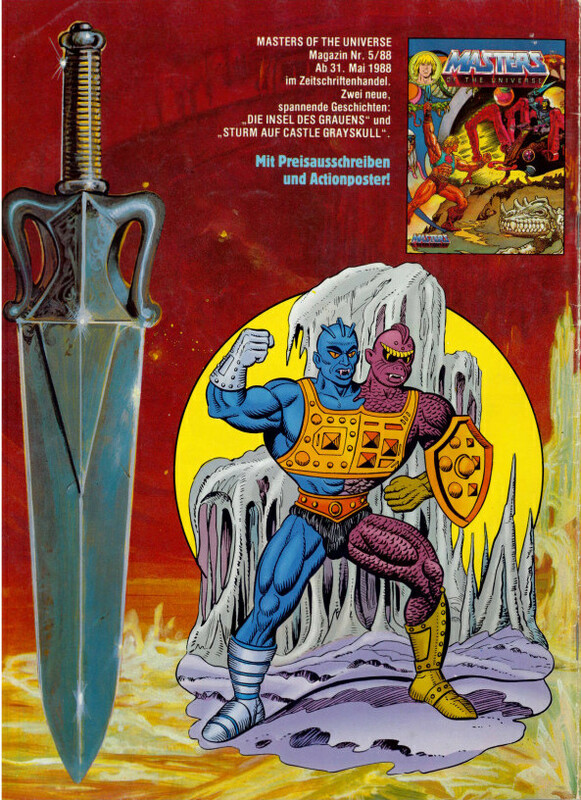 The Style Guide seems to have taken a cue from the commercial shown earlier in this article, in which Two Bad tricks his enemies into thinking he is actually two evil warriors. 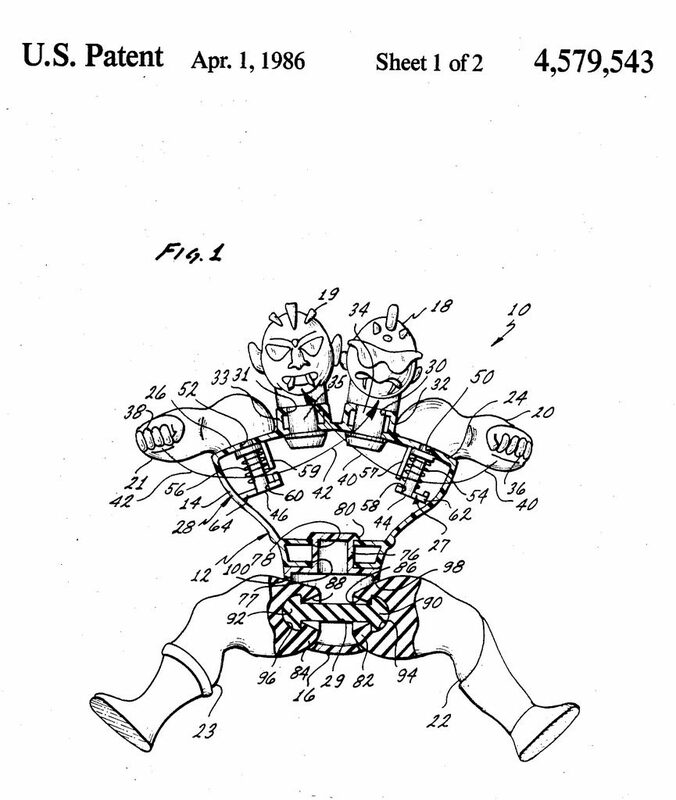 Mattel filed for a patent on Two Bad on December 24, 1984. The inventors lists were Larry Renger and Roger Sweet. 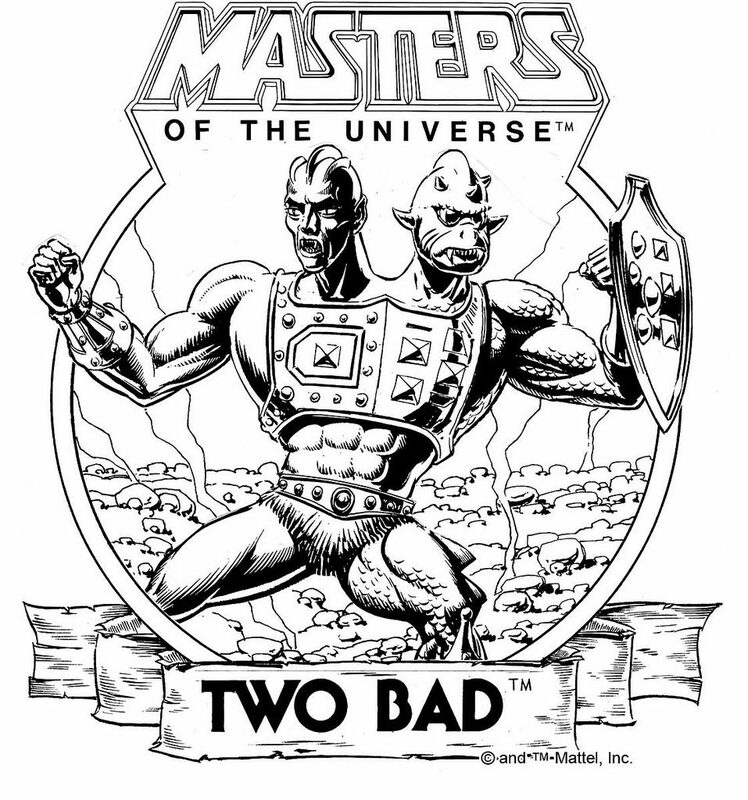 The trademark for Two Bad was filed September 10, 1984. 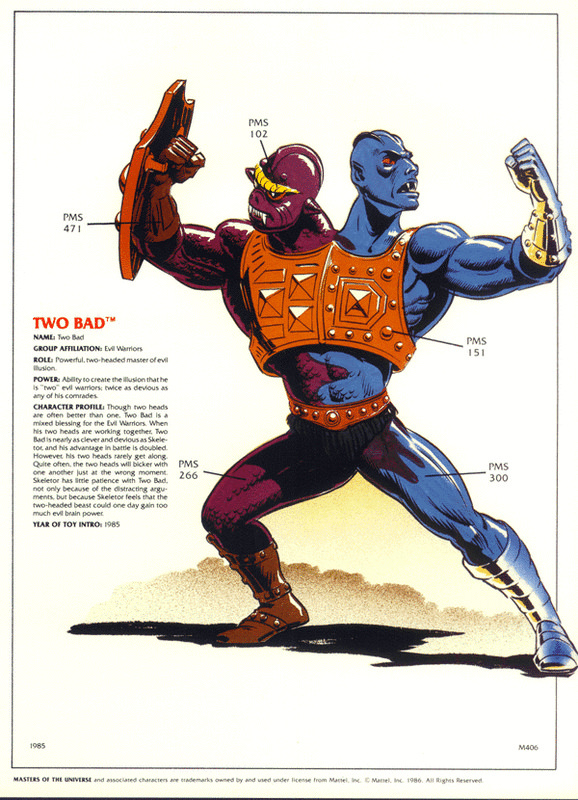 Two Bad was characterized in much the same way in his infrequent appearances in the Filmation He-Man cartoon. 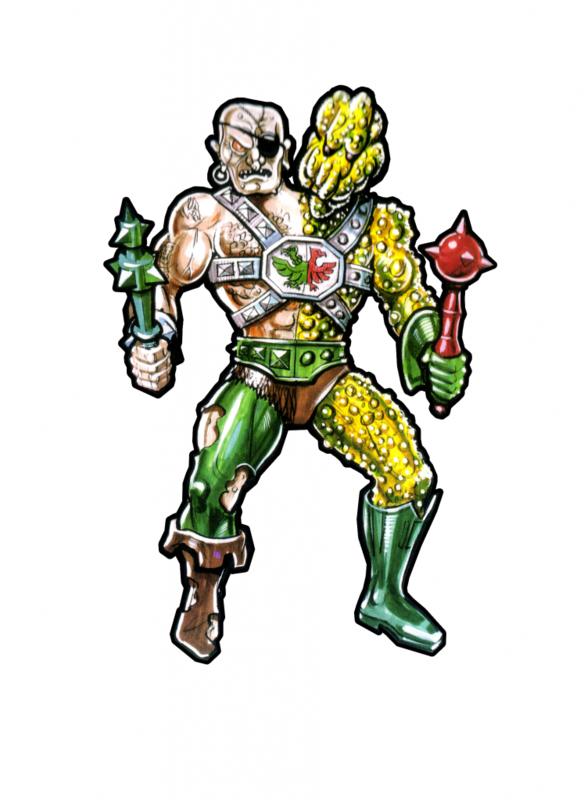 Update: In the comments below, Aidan notes that Two Bad was characterized as an inventor in the UK MOTU comics, so he wasn’t always characterized as a simpleton. 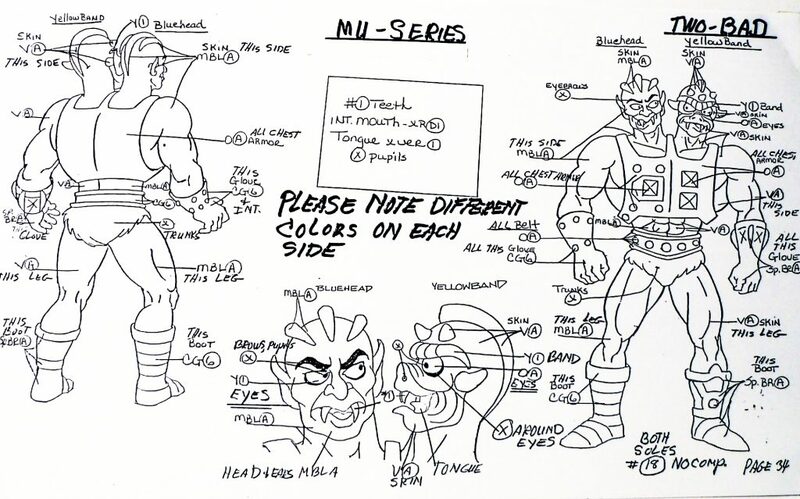 Aidan also notes that the individual heads were named Blue Head and Yellow Band, which apparently originated from notes at Filmation studios.